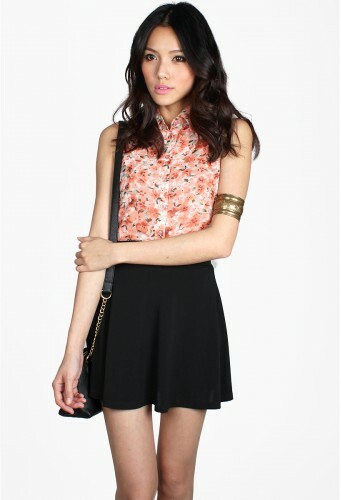 Nothing spells demure like the collared neckline and dainty floral print of this top. Its cropped fit gives it a contemporary twist, making it perfect paired with denim shorts for a casual Saturday out. For a smarter look, pair it with a pencil skirt and cinch it at the waist for a flared fit that flatters your figure. Made of chiffon (non-stretchy), fully lined (lining: cotton-polyester; stretchy). Features a functional button down front, and a cropped fit. Size XS measures 14.5" pit to pit, 18.5" length. Size S measures 15.5" pit to pit, 18.5" length. Size M measures 16.5" pit to pit, 18.5" length. Model is a UK 6/8, 1.65m, wearing size S.